Heart's Delight Cards: Lots of Happy Alternatives! 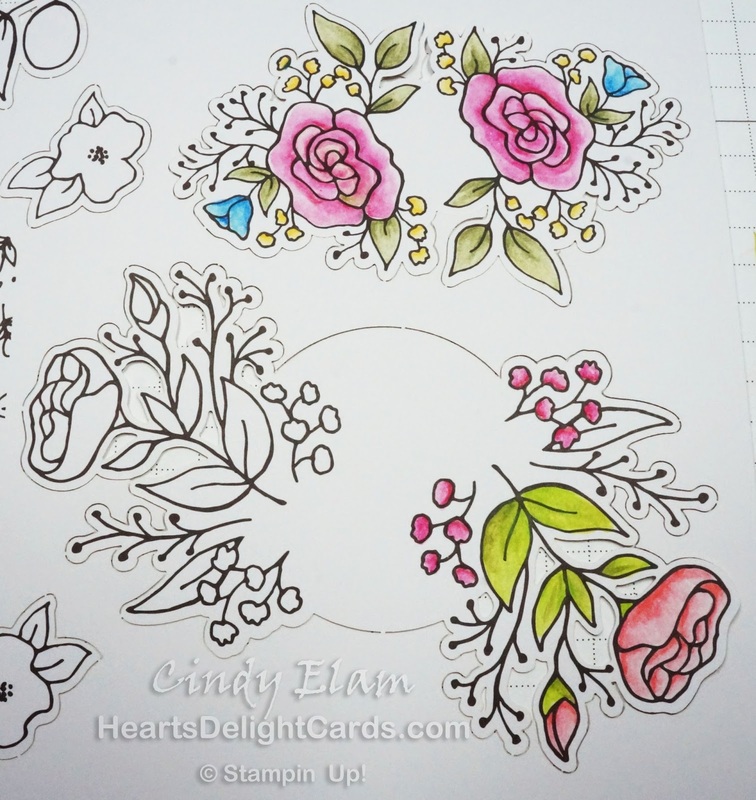 Leave the die cuts attached to the sheet while you are coloring them. It stabilizes them and makes them easier to handle. Once they're colored, go ahead and pop 'em out. If you want to use a Blender Pen or Aqua Painter, just color a small bit of each part of the image. Then use the BP or AP to pull the color into the rest of the image. To deepen the color (for depth, shadows, etc.) pick up some color directly from the Watercolor Pencil tip with the tip of an Aqua Painter and add it to the image. Be sure to wipe off excess water on a paper towel first. 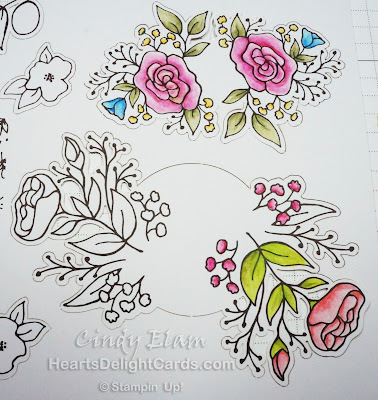 The dies cuts are not watercolor paper, so don't work one area too much, or the paper will pill up. You can practice your technique around the edges of the die-cut sheet before you move on to the real thing! I thought the blossoms looked like they belonged in a flower box, so I turned the small Sahara Sand rectangle into a box and then popped the flowers up on dimensionals. 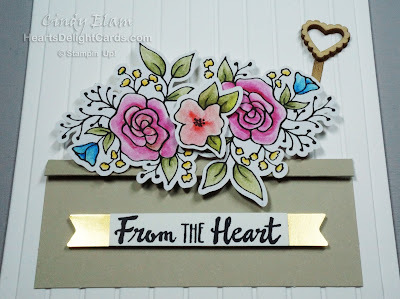 The heart "garden stake" is a retired embellishment on a narrow strip of Wood Textures DSP. I borrowed the greeting from Petal Palette, because it fit perfectly for the size I needed, as well as the theme, and you've probably noticed I used different watercolor pencils, too. The embossed background is the new Simple Stripes embossing folder. It looks like painted wood siding, doesn't it? So, there you have it - an alternative to the little, teensy, tiny card in the kit. 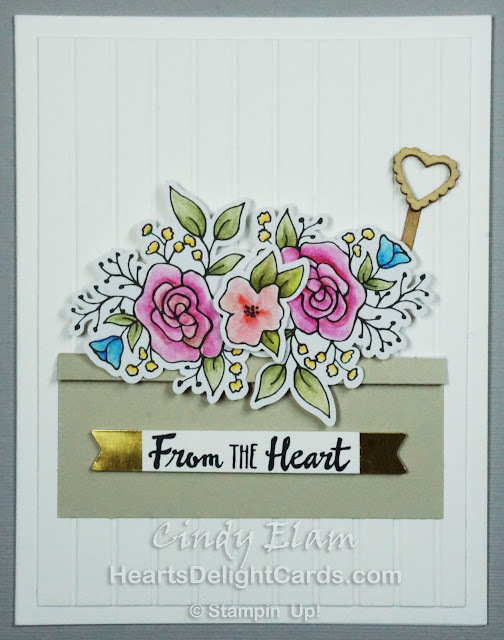 Just add a blank card base, an embellishment and you're finished!